BACK RELIEF YOU CAN BELIEVE IN! You may have heard of Boswellia serrata as a co-factor in many joint health products, but patented Boswellin® is the gold standard for this botanical extract. 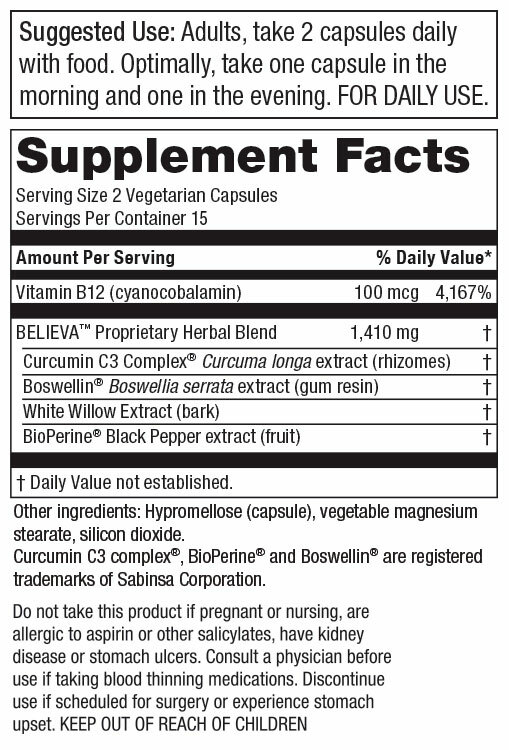 * Boswellin® was developed to enhance the multi-action effect of Boswellia serrata. Do you imagine what it would be like to do these things without aches and stiffness in your lower back and joints? That was the case for the men and women in a 2018 clinical study on lower back discomfort. It was a 30-day double-blind, placebo-controlled study — meaning that half of the participants were given a new, unique nutritional supplement formula, while the other half got a placebo — and nobody knew which one they were taking. By Day 15, nearly half of the test subjects who got the nutritional supplement were experiencing significant benefits. By Day 30, nearly all of them were showing measurable improvements on one or more assessment criteria, including 73% who could now touch their toes! By contrast, the placebo takers had very little change at all. That’s why we call this formula BELIEVA™ - because the people in the clinical study taking the supplement began believing what they were seeing: a renewed ability to be comfortable and active. Are you ready to become a BELIEVA™? Feeling better in just two weeks! My shoulder is definitely improved and I am sleeping better! 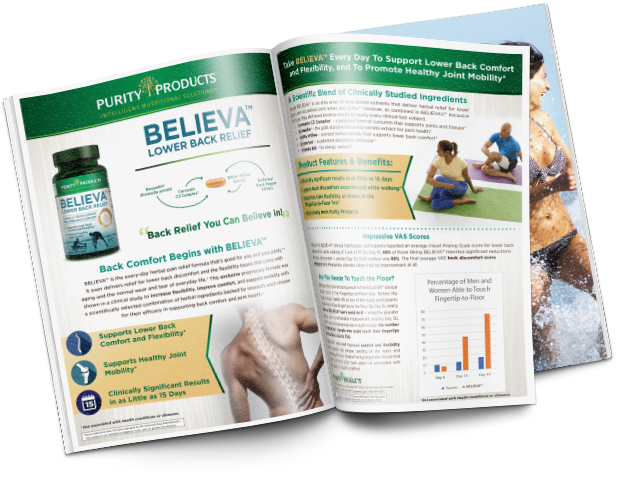 After taking Believa for a short time, I am more flexible, the burning in my lower back and hip area is gone, as well as, my pain. It truly has changed my life. Thank you for the Believa. My muscles feel more relaxed and my spine moving more freely. I am definitely standing straighter. I have been taking Believa for the past 3 weeks and the pain has disappeared. After 2 weeks of taking the Believa, my lower back and even my knees and shoulder are strangely feeling much better. Each of these assessments on their own are accurate for evaluating discomfort levels and changes over time, and nearly every chiropractor and orthopedist use one or more of them in their practice. However, the researchers wanted to leave no doubt in their findings, so they used all five. And what they discovered was amazing to behold and clinically significant in their results. 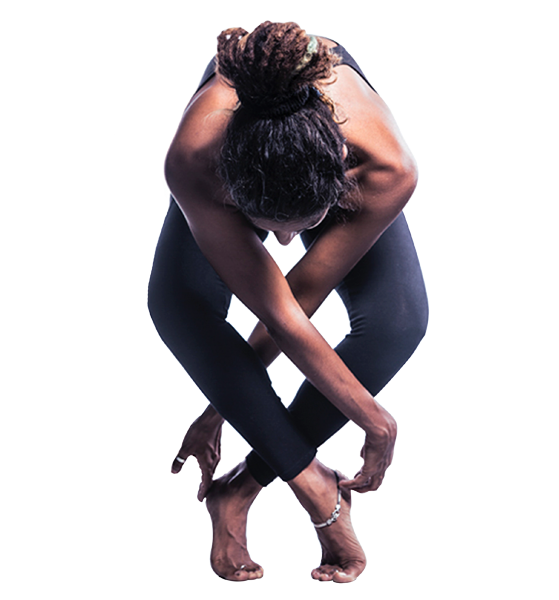 As measured on one or more of the 5 assessment criteria, nearly every person taking BELIEVA™ experienced improvements in lower back comfort and showed concrete signs of increased joint flexibility and mobility. However, the numbers on two of the evaluations - the VAS While Walking and Fingertip-to-Floor Flexibility Test - were life-changing. When the BELIEVA™ clinical trial began, participants reported an average Visual Analog Scale score for lower back discomfort while walking of 7 out of 10. 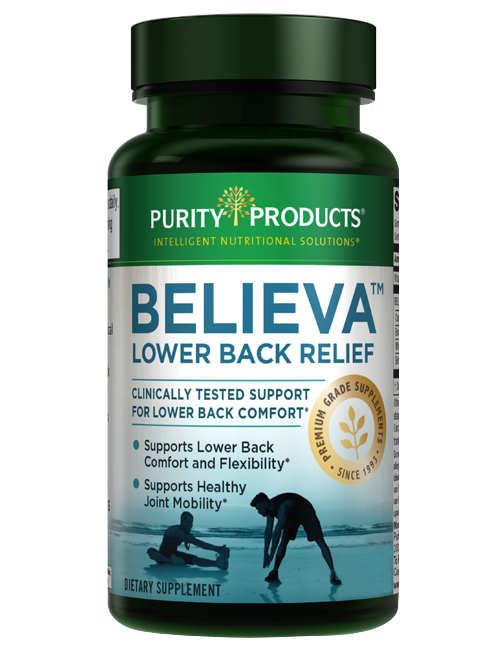 By Day 15, 68% of those taking BELIEVA™ reported significant reductions in back discomfort — and by Day 30, that number was 88%. The final average VAS discomfort score dropped to 4. Meanwhile, placebo takers had no improvement at all. Perhaps the most amazing result in the BELIEVA™ clinical study came in the Fingertips-to-Floor test. Before the study began, barely 7% of any of the study participants could touch their fingertips to the floor. By Day 15, nearly 44% of BELIEVA™ users could do it - while the placebo group saw no noticeable improvement. And by Day 30, while the placebo group saw a slight nudge, the number of BELIEVA™ people who could touch their fingertips to the floor rose to 73%! BELIEVA™ delivered improved comfort and flexibility that literally had people bending at the waist and reaching the floor, despite having begun the clinical trial with confirmed lower back issues not associated with any injury or health condition! BELIEVA™ is backed by science — and delivers significant clinical results as shown in a double-blind, placebo-control study. Think about all the activities you could do once you gain these health advantages. Whether it’s exercise, sports, gardening, walking, playing, lifting — BELIEVA™ can help give you the ability to stay active and enjoy life more. Become a BELIEVA™ Try it today! † - $5.00 Trial Fee applies, plus $4.95 shipping and if applicable your state and local tax. By accepting our exclusive Trial offer for BELIEVA™ (15 day supply) you will be enrolled as a Super Saver. As a Super Saver, you will receive 3 bottles every 90 days at the discounted price of just $29.95 per bottle (45% off retail), plus $4.95 shipping and if applicable your state and local tax, charged to the payment method provided today. Each bottle is a 1-month supply. Your first delivery of 3 bottles will ship about 2 weeks after you receive your Trial bottle, so you don't miss a day. If you wish to change the frequency, date of shipment or number of bottles on Super Saver, you can sign up for online access or call Customer Care at 1-888-769-7873.